"You couldn’t wish for a better located, more functional and beautiful place to be, and the RidgeGate development offers so many amenities. We are really looking forward to becoming a part of the Lone Tree community." 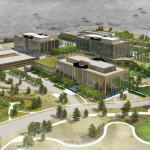 LONE TREE, Colo.--(BUSINESS WIRE)--This morning, Charles Schwab & Co., Inc., is celebrating the grand opening of its new Colorado campus in Lone Tree, Colorado. 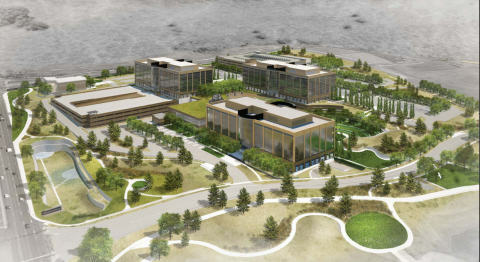 A total of approximately 1,900 Denver-area Schwab employees will move into the 650,000-square-foot, 47-acre campus in staged phases over the next year and a half, enabling the company to consolidate the majority of its Colorado operations in one facility, which is located at 9800 Schwab Way (at the corner of Park Meadows and Lincoln). The campus, when completed, will include three five-story office buildings as well as a standalone branch office, which opened last May. Located in the RidgeGate master-planned community, the new campus will provide a new home for Schwab's service center facilities, which are currently in three leased buildings at two separate locations north of RidgeGate along the I-25 corridor. Three of the company’s four local retail branch offices will remain in their current locations: at 201 Columbine Street in Cherry Creek; 518 17th Street in downtown Denver; and 2480 Canyon Blvd. in Boulder. The fourth Denver-area branch office relocated to a prominent location on the new campus, facing Lincoln Avenue just west of I-25. The Schwab campus was designed to create a sustainable, visually appealing and strong identity within the community, which itself blends natural open space with mixed-use density. Situated for solar orientation, the campus’ buildings are nestled into the existing site topography and optimize views of Mount Evans, Indian Peaks, Longs Peak and the downtown Denver skyline. Landscaping reflects the natural Colorado landscape, with native grasses, plants and trees that tie into the surrounding prairie. The site and buildings all incorporate sustainable materials and systems, targeting LEED Gold certification. To date, approximately 70 percent of the campus has been completed, with two of the three buildings ready for occupancy. The third building is expected to be completed in the summer of 2015. Click to Tweet: @CharlesSchwab celebrates grand opening of new Colorado campus @CityofLoneTree. While San Francisco remains Schwab corporate headquarters, Colorado is one of nine geographically important employment centers for the company. Schwab has approximately 13,400 employees nationwide, of whom approximately 1,900 are in Colorado, representing Schwab’s third largest employment center. The company’s major employment centers, ranked by size (largest to smallest), are Phoenix, San Francisco, Denver, Austin, Indianapolis, Orlando, Richfield (Ohio), Chicago and El Paso. In addition, Schwab has more than 225 retail branch offices across the United States. Schwab has been in Colorado since 1978, when the company opened its first Colorado branch office in Denver. Colorado now has seven retail branches, of which four are in the Denver metropolitan area. The company opened a service center in Denver in 1991. Local Colorado employees work across a wide range of business functions, including Schwab Investor Services, Schwab Advisor Services, technology, operations and human resources among others. In 2013 and 2014, Schwab was named a Top Workplace by The Denver Post, earning the number 5 and number 9 spots, respectively, on the list of top large companies. Job-seekers interested in a career at Schwab should visit www.aboutschwab.com/careers. More information is available at www.aboutschwab.com. Through its operating subsidiaries, The Charles Schwab Corporation (NYSE: SCHW) provides a full range of securities brokerage, banking, money management and financial advisory services to individual investors and independent investment advisors. Its broker-dealer subsidiary, Charles Schwab & Co., Inc. (member SIPC, www.sipc.org), and affiliates offer a complete range of investment services and products including an extensive selection of mutual funds; financial planning and investment advice; retirement plan and equity compensation plan services; compliance and trade monitoring solutions; referrals to independent fee-based investment advisors; and custodial, operational and trading support for independent, fee-based investment advisors through Schwab Advisor Services. Its banking subsidiary, Charles Schwab Bank (member FDIC and an Equal Housing Lender), provides banking and lending services and products. Brokerage Products: Not FDIC Insured • No Bank Guarantee • May Lose Value. More information is available at www.schwab.com and www.aboutschwab.com.